Los Angeles’s vibrant dining scene has a record-setting list of over 330 participating in this 12-day dining event. Noteworthy newcomers include Silver Lake gastropub Black Hogg, Hollywood hotspot littlefork, Los Feliz stand-out MESSHALL and Abbott Kinney darling Willie Jane. The Restaurant at Mr. C will offer specially priced prix fixe menu options for lunch and dinner featuring Cipriani signature dishes and Italian favorites. $25 Lunch Menu includes Tomato soup with croutons with a rucola salad with cherry tomatoes and shaved Parmesan Mortadella and Cetriolini. Main Course a choice of Homemade lightly baked green Tagliolini with veal ragu boneless chicken Spezzatino al curry served with mango chutney or a Pan fried salmon with roasted peppers served with rice pilaf. Vegetarian option available upon request. Dessert is an Assortment of Sorbetti for $25 per person, not including tax or gratuity. $45 Dinner Menu includes Pasta e Fagioli, baby spinach salad with mushrooms and crispy bacon prosciutto cotto with mozzarella. Main Course a choice of homemade lightly baked white Tagliolini with ham or Chicken Spezzatino alla Pizzaiola served with rice pilaf or grilled Branzino served with Peperonata. Vegetarian option is available upon request. Dessert is Assorted Ice Cream. 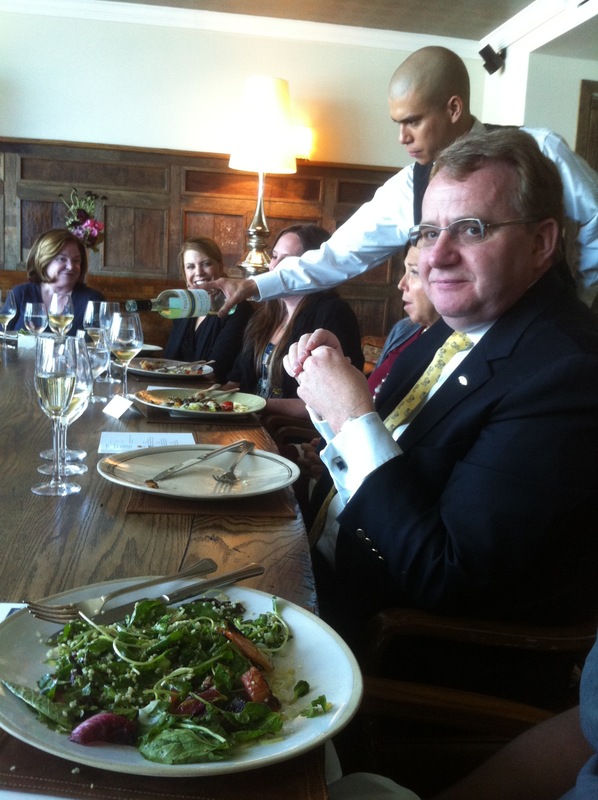 $45 per person, not including tax or gratuity. $20 per person for an optional wine pairing. Enjoy a three-course dinner for $35. Start with a sweet corn Veloute or Weiser Farm melons with arugula and yogurt. Entrees include a nice piece of local sea bass with cannel inis with zucchini flowers and black garlic or Niman Ranch pork belly with coco beans, sweet corn and a stone fruit compote. Cheese and dessert finish the meal. 6221 Franklin Ave. Los Angeles – (323) 871-2026. Enjoy lunch or dinner next to the historic 1920’s Downtown LA’s landmark public library, surrounded by metropolitan skyline views, while sitting in a lovely garden setting. Inside the dining area offers floor to ceiling windows. Executive Chef Sydney C. Hunters III prepares a contemporary Californian-French menu featuring fresh, sophisticated dishes inspired by the farmers’ market as well as a daily rotisserie.downtown next to the Library Tower for $20. Dinner is $35 per person. Choose one dish from the appetizer selection: Tomato Gazpacho with toasted almonds, cherry tomatoes, micro basil or Burrata with peperonata, sherry vinaigrette, pesto, arugula; or Albacore Sashimi with sushi rice, soy sauce sabayon, yuzu kosho, and daikon sprouts. The Entrée Selections include: Corn Risotto with Mexican shrimp and baby corn; Jidori Chicken with Coq au vin garnish, pearl onions, button mushrooms, applewood smoked bacon, beurre rouge or Hanger Steak with creamy polenta, broccolini, in an au poivre sauce. 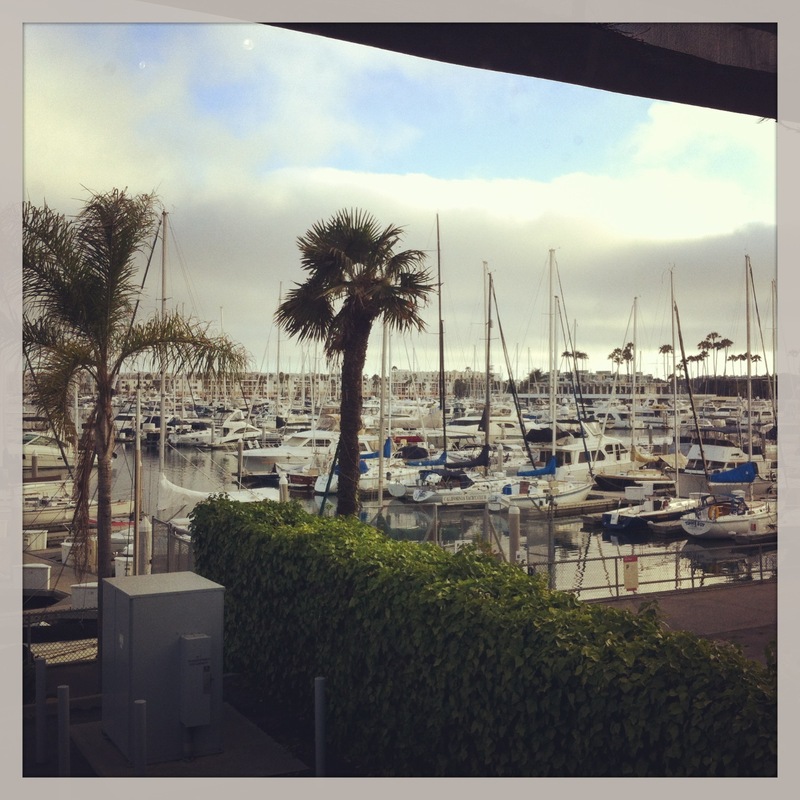 Guests can Mediterranean-inspired dishes from Executive Chef Daniel Roberts while enjoying views of million dollar boats in the Marina del Rey harbor. 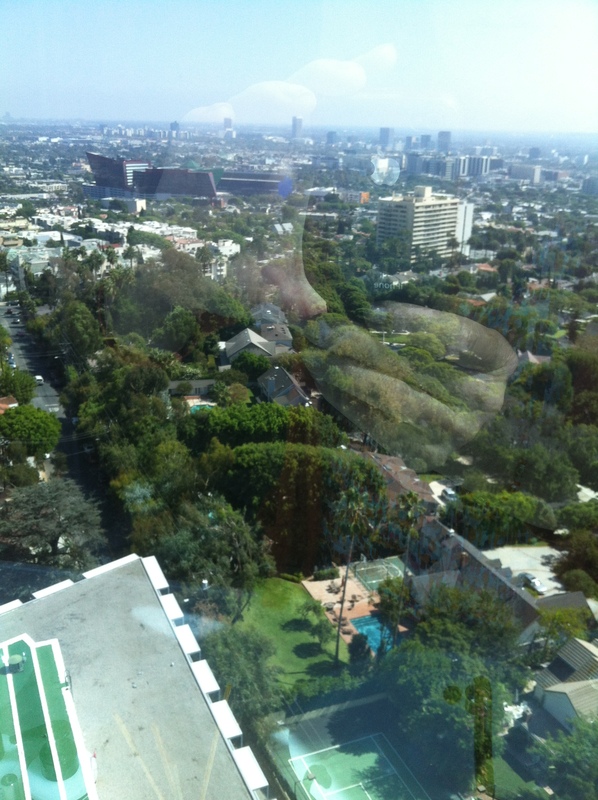 Here is a list of hotels with restaurants that are participating with dineLA. Stay at a participating hotel for two-nights or more, pay with an American Express card and get a $50 American Express gift card. Driving out to Palm Springs from Los Angeles is always a pleasant surprise. During the two-hour drive, I enjoy watching the temperature gauge in my car climb higher, as I pass the Morongo casino and enter the land of windmills. In June through Sept. the temperature reaches as high as 112 degrees, however it’s a dry heat, so you don’t feel as wet and sticky as you would in the East Coast or Southern states. To escape the heat during the day, take a ride up the world’s largest rotating tramcar for a ten-minute ride to an elevation of over 8,500 above sea level. It’s at least 20 degrees cooler and the multi-million dollar views are spectacular. There is a fine dining restaurant and café to satisfy your hunger. During the Restaurant Week from May 31 to June 16, 2013 tramway fares are discounted from 4 p.m. to $18 for adults and $12 for children ages 3 to 12.To see all of the special deals, go to www.palmspringsrestaurantweek.com. 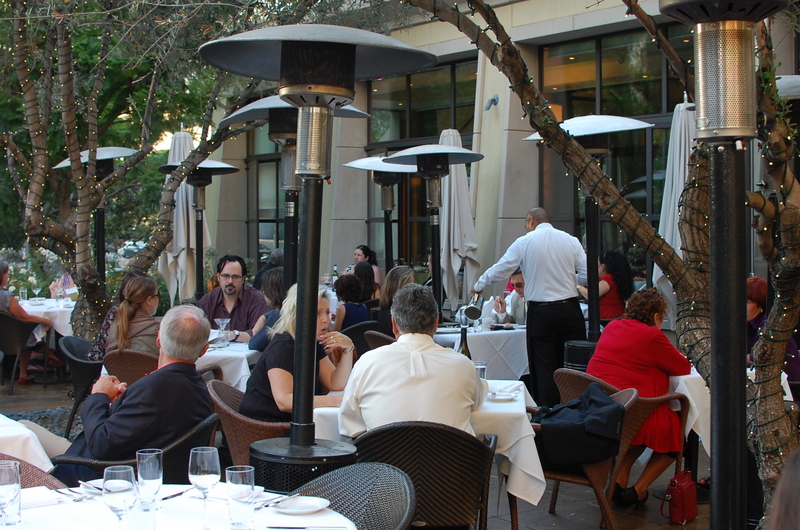 Other ways to stay cool are to dine at one of the restaurants offering refreshing patio misters or book a spa treatment and enjoy the cool air-conditioned oasis. 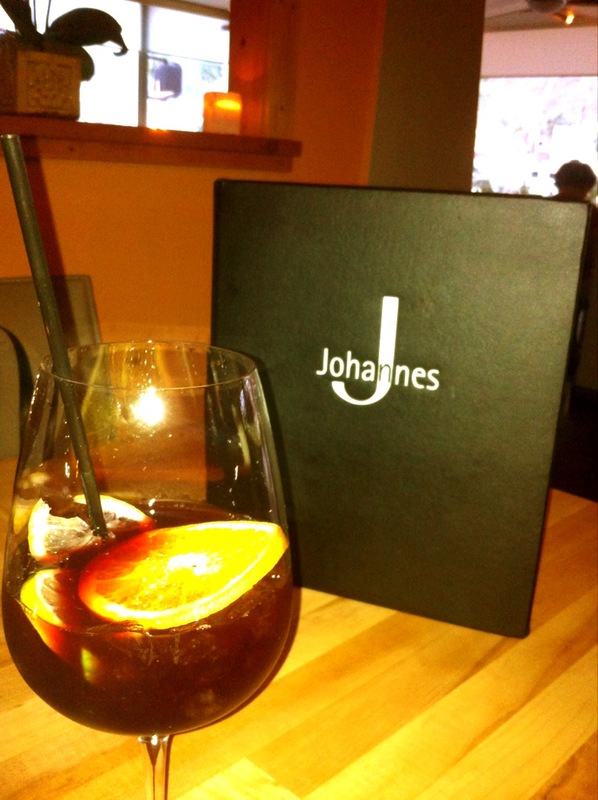 Johannes – Three-courses of award-winning Continental fare with an Austrian twist is prepared by the “Eclectic Chef” Johannes Bacher. When the sun blazes and the desert floor heat rises, it’s a great time to find shade and sit by a refreshing pool. During the summer months and especially Restaurant Week from May 31 to June 16, 2013, many of the “hottest” resorts are drastically discounted. 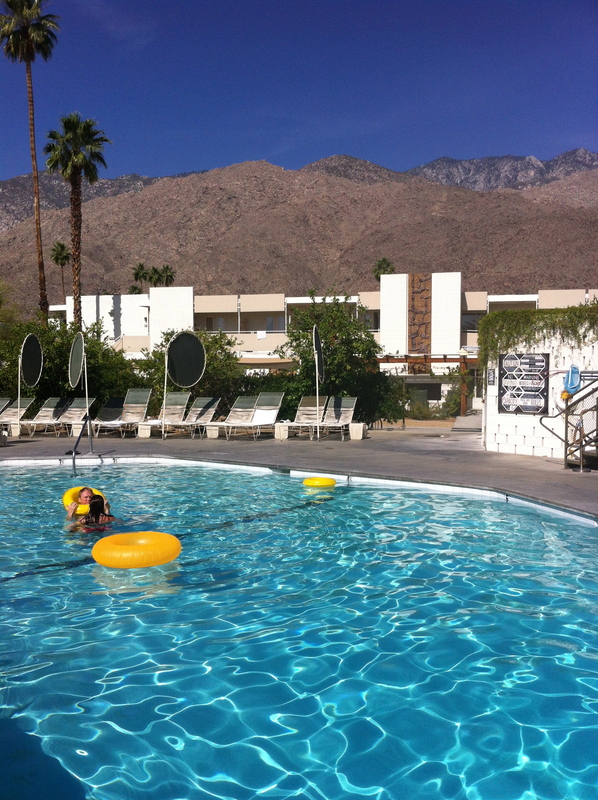 I checked out various hotels in the Coachella Valley to find the most inviting pools. They had to have an “it” factor to make my list. Some feel like the old glamour of Hollywood when movie stars escaped to their desert enclave for cocktails, music and sitting by the pool. One may feel as if they woke up in Morocco, while staying at this North African looking desert resort in Palm Springs. 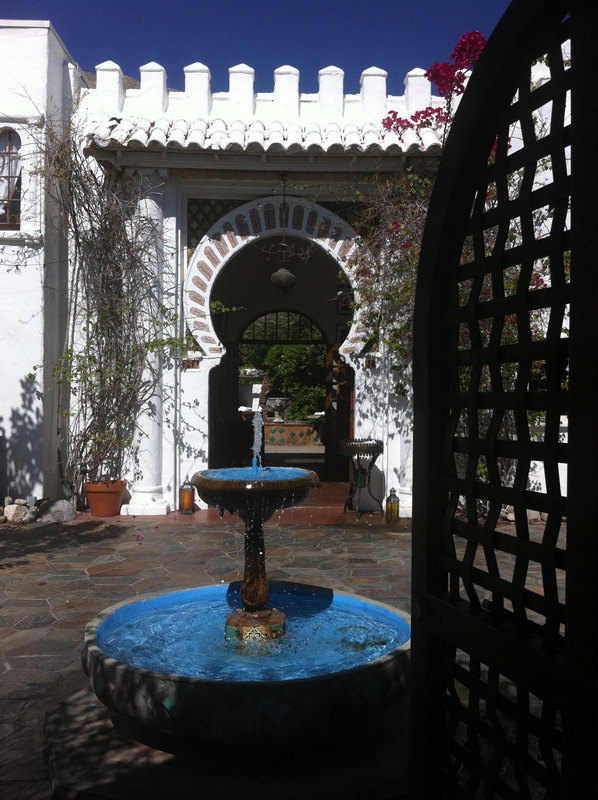 Built in 1924 as a Moroccan villa, it was a hideaway for Scottish Painter Gondon Courts who once lived in Tangier. Located on 1.5 acres are two restored historic villas, bungalows, guest houses, gardens and pool. Originally named, Dar Marroc, the villa was rescued in 1989 and renamed Korakia (Greek for “crow”). 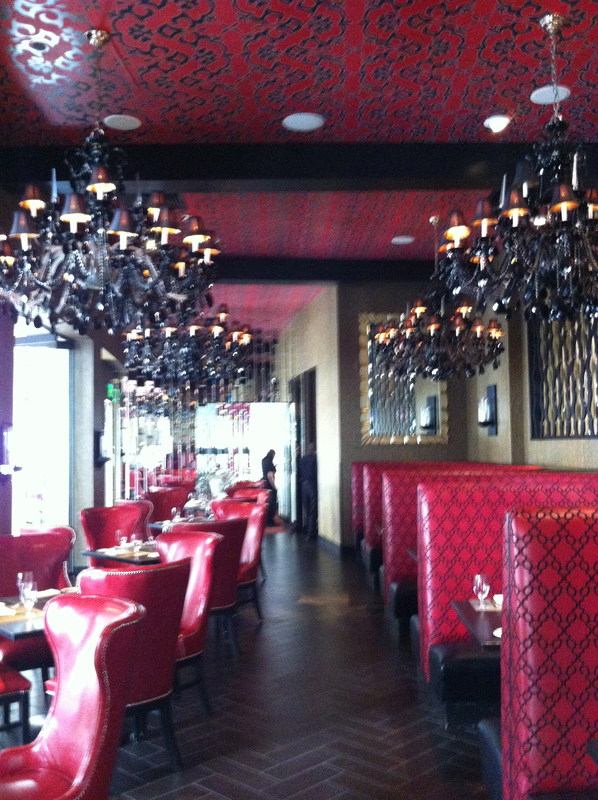 Moroccan designs and decor were enhanced with deep ocher and tawny yellow colors. The distinct key-hole shaped entrance and carved wooden Moorish doors greet guests upon arrival. The sun drenched pool area with glorious views of the San Jacinto mountains is a gathering spot during the day. In the evening Moroccan laterns and fire pit illuminate the heated pool. During Restaurant Week (May 31 to June 16) enjoy Standard room rates for $129. Studios are $169 a night from Sunday through Thurs. 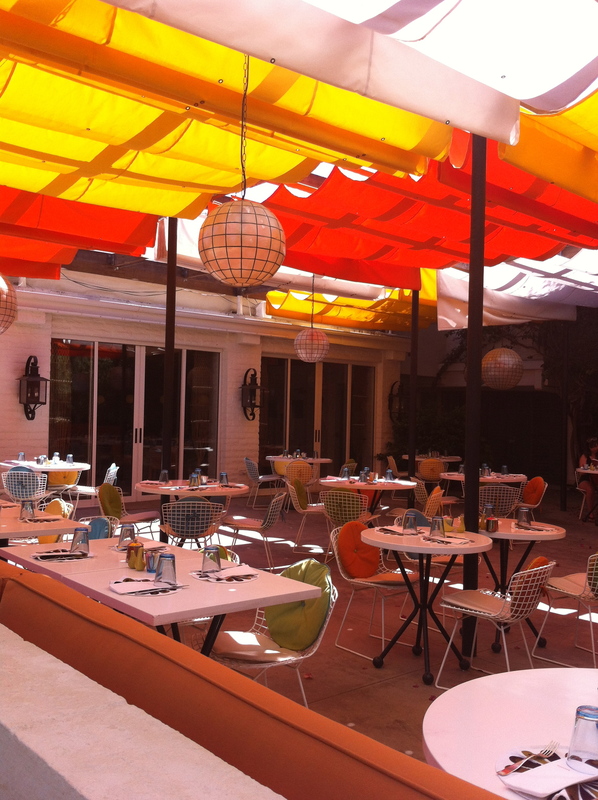 A fully cooked breakfast is served in the Moroccan courtyard is included. In the afternoon guests are treated to a Moroccan tea service. 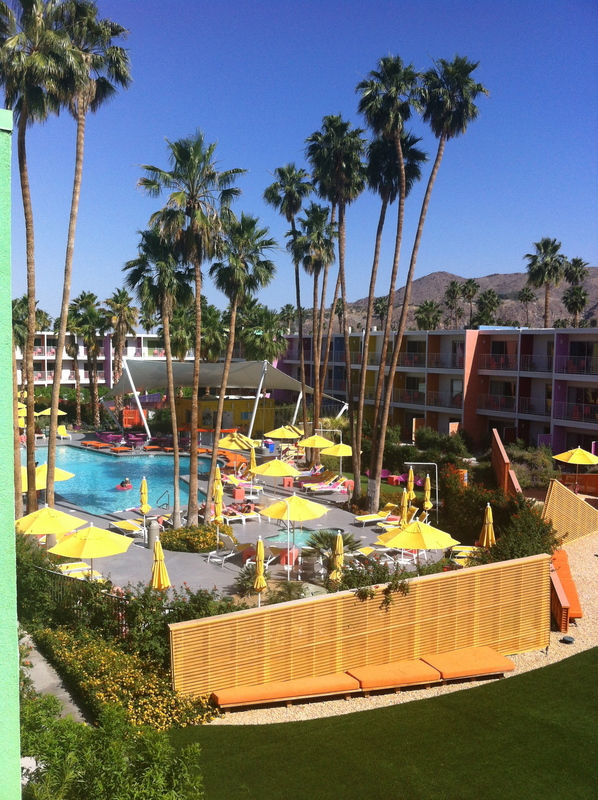 The Saguaro offers the most kaleidoscope of vibrant hues throughout the hotel and pool in Palm Springs. I call this the “end of the rainbow” resort. There are 16 bold colors throughout this 245-room hotel, that was once a Holiday Inn. Now managed by Joie de Vivre Hotels, renowned architects Peter Stamberg and Paul Aferiat infused the colors of indigenous flowers found in the desert with the lines of the mountain range next to the expansive pool and inviting courtyard area. The grounds and gardens were renovated in Feb. 2012. Hummingbirds flit around the brilliant purple blooming Mexican sage. Restaurant Week Speical: Enjoy Accommodations for two. Receive an Iron Chef gift before dinner for two at Tinto’s with a special Restaurant Week menu. Receive a copy of Executive Chef and Iron Chef Jose Garces “The Latin Road Home” cookbook. Later live it up with a Intraceuticals Spa Treatment. Last you will be given two tickets of admission into the Palm Springs Art Museum. This package is only $258.90 per room, double occupancy. Rate does not include the $18 resort fee. Subject to availability. Tinto restaurant is a crowd pleaser. Executive Chef and Iron Chef Jose Garces manages two restaurants: El Jefe, a Wild-West style Mexican restaurant and margarita bar, and Tinto, a Northern Spain type of restaurant. Tinto, is an expression in Spain, used to describe red wine. 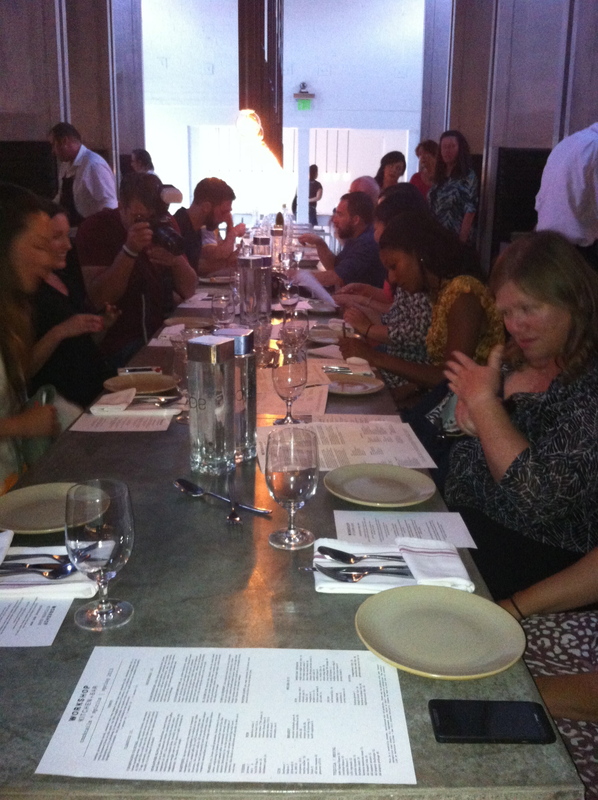 It’s an intimate restaurant at La Saguaro serving Basque food. Various types of wine openers are displayed in the glass and wood tables. Order a fruity white sangria paired with plates of charcuterie & cheeses. Be sure to try the large prawn brochettes with shrimp and chorizo, grape tomato and espelette chile. The dates wrapped in bacon are heavenly. 1800 East Palm Cyn. Drive, (877) 808-2439 – http://www.jdvhotels.com/hotels/california/riverside-hotels/the-saguaro-palm-springs. Originally a 1930s Desert inn, called Estrella Resort & Spa, the Viceroy Palm Springs has a wonderful history of old Hollywood stars such as Bette Davis and Joan Crawford swimming in one of the three pools.Designer Kelly Wearstler took the 74 room Inn and designed the suites to resemble Old Hollywood Regency style into a more modern and fabulous look. Restaurant Week Specials: Save 30% off the Best Available Rate during the weekdays and 25% off during the weekends. Minimum length of stay may be required. Use code “STAY” Dine at the on site Citron for their special dining discount of a gourmet 3-course dinner for $38 per person. Fine dining inside Citron Restaurant or Poolside offers guests a multitude of culinary options. 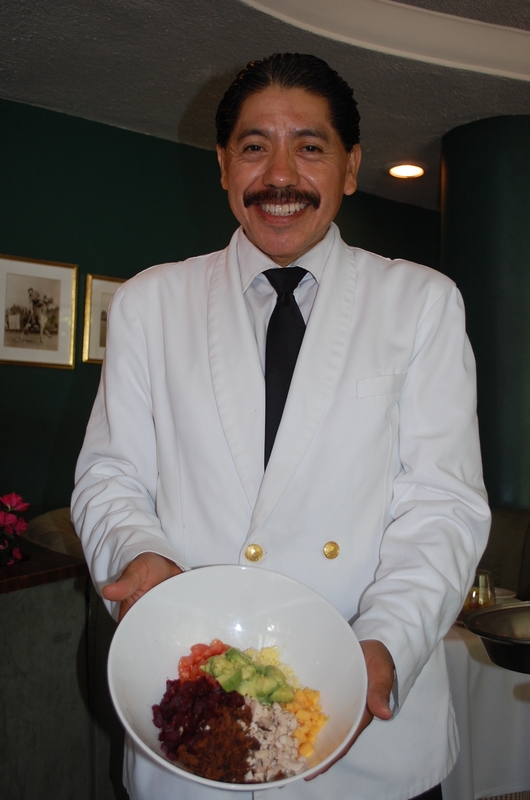 Executive Chef Warren Cordoba is serving during Restaurant Week a refreshing Watermelon French Feta salad with wild mint from his on site garden topped with preserved strawberries. For an entrée, the grilled Tamarind marinated shrimp is served Cuban-style with rice and black beans, a little cilantro and dressed with a preserved lime and butter sauce. Finish with a frozen key lime mousse pie with candied ginger. All dishes are light, fresh and ideal for a light summer meal. Imagine going on a desert safari with a group of hipsters and your wind up at the newer Ace Hotel & Swim Club. 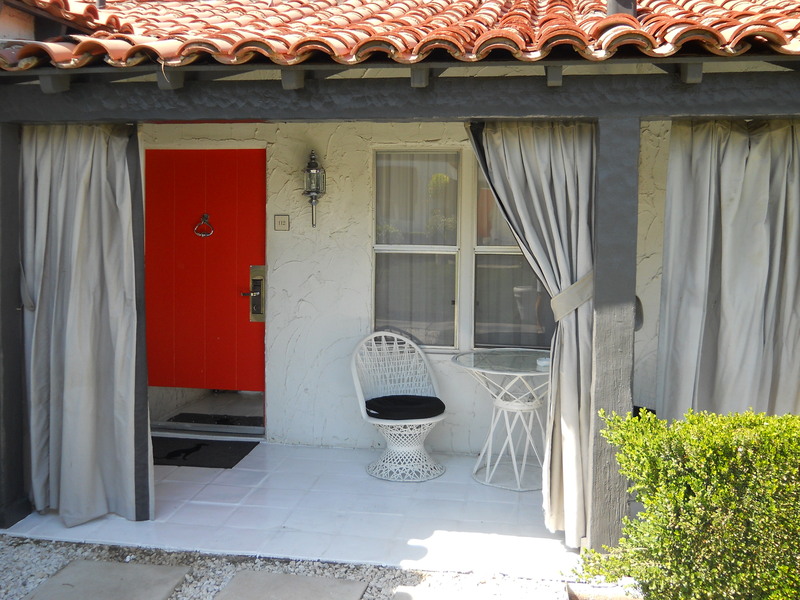 This mid-century 170 room hotel, spa & resort is located near the heart of Palm Springs. Built on the foundation of a 1965 Howard Johnson hotel, Ace Hotel & Swim Club in Palm Springs offers two chlorine free pools and hot tub soakings everyday til 2am. Restaurant Week Specials: Acquire an Easyrider package to collect a $25 nightly resort credit towards food and beverage or a spa treatment (room service is not included). Rates are $119 during the week and $129 during the weekends. Tax and Resort Fee is not included. You never need to leave the property. Enjoy a 3-course dinner at King’s Highway for $26 per person. 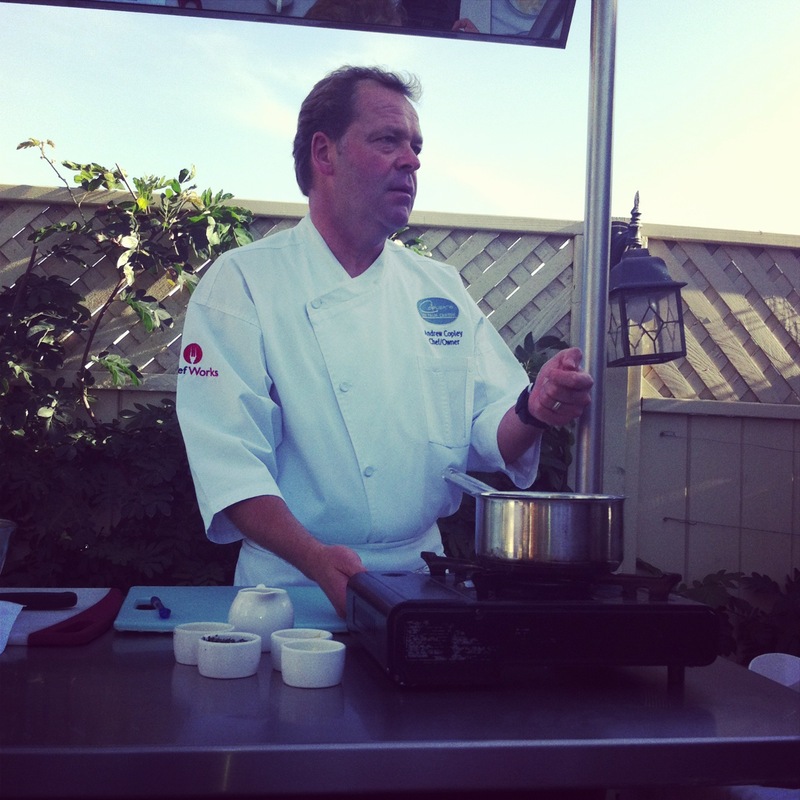 Chef Brian Kiepler offers guests a choice of three appetizers including a fried avocado salad. Entrees include a leg of lamb or roasted halibut cheeks. For dessert the key lime pie and chocolate stout bread pudding will satisfy your sweet tooth. During Restaurant Week enjoy a 25% discount on any Spa treatment at Feel Good Spa when you show your King’s Highway or Amigo Room receipt from May 31 to June 16, 2013. The fully decked-out gym is open to hotel guests 24 hours a day. You also have full access to regular poolside events, including DJs, bands, yoga classes, impromptu dance parties and a large amount of lounging. Stay for breakfast to enjoy Chef Brian’s menu filled with local, seasonal and organic ingredients. Try the chilaquiles, Parmesan hash browns, brioche French toast and healthy Tofu and veggie scramble. Checking out a few of the bohemian-style rooms, Levi Strauss made the denim headboard in the Desert safari suite. All rooms are earth-friendly with sustainable elements. Vintage furniture, old record players and clipped on wall art give the rooms an organic feel. Some have a garden patio and others a fireplace. This place is dog friendly, so don’t leave spot home. 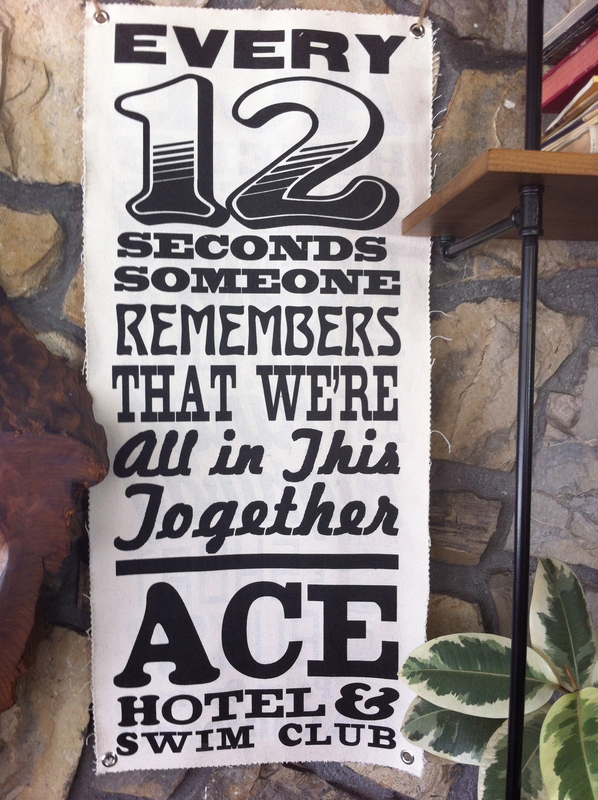 701 E. Palm Canyon Dr. (760)325-9900 – http://www.acehotel.com. This illustrious property was originally a Holiday Inn in 1959. Then Gene Autry, the singing cowboy lived here and named the property – Melody Ranch. He added a two-bedroom, two-bathroom residence, that guests can now rent. It offers an enclosed patio, as well as a large living room, dining room, terrace and kitchen. Located a few steps from the saline Autry Pool, this residence is the place to be for the ultimate in luxury while enjoying all the estate’s amenities. Restaurant Week Special – Dine at the 5-star diner, Norma’s at Night for $26 per person. Sit inside or out on the lovely patio. Three appetizers include corn off the cob and salt & pepper calamari. Entrees include 5 different dishes. The chicken pot pie piping in puff pastry and Meatball and spaghetti look nightly fine. There are two outdoor pools. The saline pool is completely chlorine-free, while the Silicone Valley pool, is family friendly. The Gene Autry pool is open 24 hours to our guests, and is the “Adults Only” pool. Both outdoor pools are staffed from 8 am until dusk. They offer a body-temperature indoor pool for guests when the Palm Springs sun gets too hot. There is also an indoor whirlpool if you simply want to enjoy a good soak. Here is where modernism meets South Beach, Florida. Original architect and visionary, Irwin Schuman fashioned the resort after major Vegas hotels like The Sands, The Flamingo, and The Stardust. Opened in 1959, the Riviera Resort immediately became the Palm Springs’ go-to hot spot for celebrities and sophisticates like Frank Sinatra, Elizabeth Taylor, Elvis Presley, Marilyn Monroe and Dean Martin. Recently, the Riviera received a $70 million dollar rejuvenation. You will instantly wowed with the jewel colors used throughout the property. Purples, reds, and yellow pop with color. 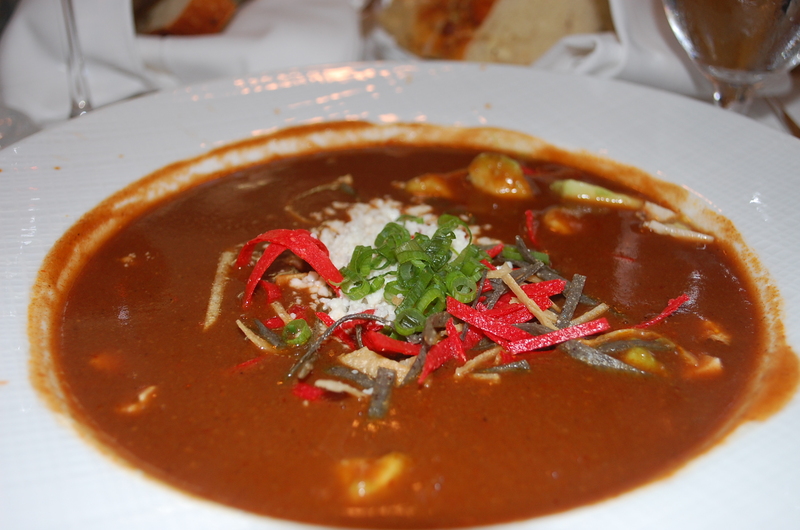 Restaurant Week Specials: Enjoy 25% off your bar bill as you stay in a midweek room for only $125 a night. Weekends the rate is $199 from May 31 to June 16, 2013. Stay on site to partake in a 3-course dinner special for $38 per person at Circa 59. The three appetizers include a scallop and beet salad with goat cheese fondue and pistachio brittle. 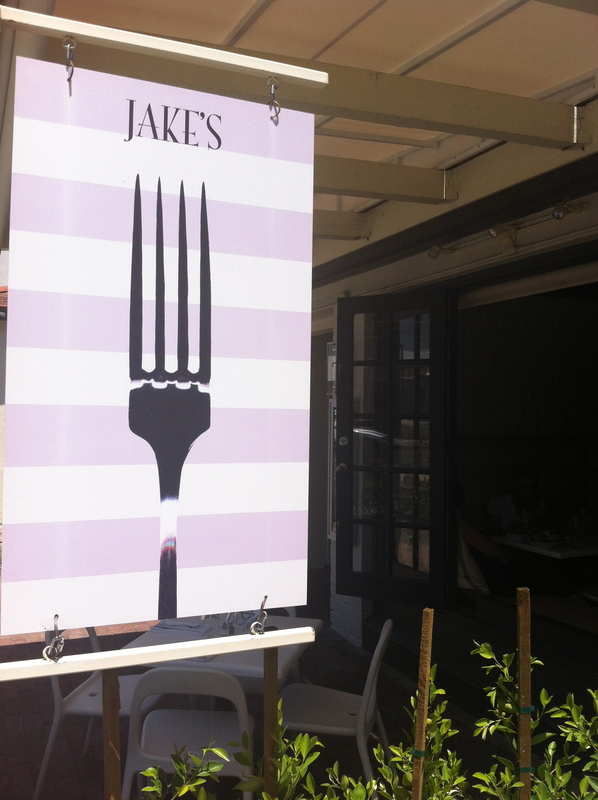 Entrees are a flatiron steak, sugar & spice pork chop and pan roasted grouper. Dessert choices include a chocolate hazelnut torte and a lemon tart. Walking past the opulent outdoor playground with elegant pool side cabanas to enter Spa Terre, I admired the oversize pool. The Riveria has one of the largest pools and two poolside bars. Guests float on rented Signature Pool Pillow floats. Restaurant Week Spa Special at Spa Terre: Mention Restaurant Week and get 25% off any Spa Terre menu selections. There are 18 treatment rooms, an expansive indoor pool and exotic Balinese, Thai and Indonesian treatments. The original architect and visionary, Irwin Schuman fashioned the resort after major Vegas hotels like The Sands, The Flamingo, and The Stardust. Opened in 1959, the Riviera Resort immediately became the Palm Springs’ go-to hot spot for celebrities and sophisticates like Frank Sinatra, Elizabeth Taylor. Elvis Presley, Marilyn Monroe and Dean Martin. Recently, the Riviera received a $70 million dollar rejuvenation.